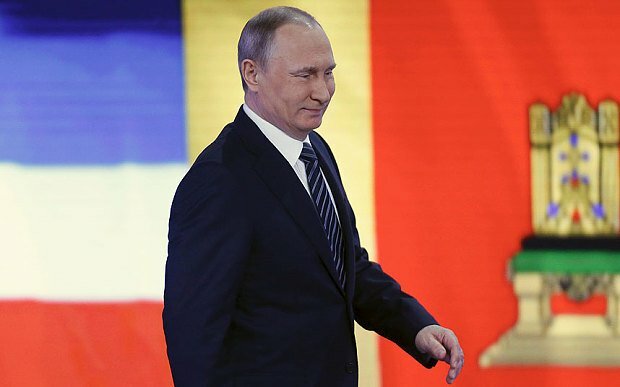 Vladimir Putin has used crude language at the 11th annual news conference to launch a furious new attack on Turkey over the downing of a Russian combat jet last month. The incident on the Syria-Turkey border was a “hostile act” but Russia was “not the country” to run away, the Russian president said. “The Turks had decided to lick the Americans in a certain place,” he said. There was, he said, a “creeping Islamization of Turkey that would have Ataturk rolling in his grave”. The remark appeared to be aimed at President Recep Tayyip Erdogan, whose AKP party, with its Islamist roots, has been accused of seeking to dismantle the secular state founded by Kemal Ataturk. Vladimir Putin is now into his third term as president since 2000, battling an economic crisis. Critics say civil liberties have been steadily eroded under his rule. He remains one of the world’s most recognizable politicians, and has topped the list of The World’s Most Powerful People compiled by Forbes magazine for the third year running. Russia deployed its air force to Syria in September in support of President Bashar al-Assad and has been carrying out air strikes on his opponents. Its intervention has been heavily criticized by Turkey, the US and Gulf Arab states. Vladimir Putin said he saw “no prospect” of ties improving with Turkey, which Russia has put under sanctions, under its current leaders. He said Turkish officials should have picked up the phone to talk to Russia about their concerns that air strikes in Syria were hitting Turkmen rebels. Turkey, Vladimir Putin said, had achieved nothing by shooting down the jet while Russia had bolstered its presence in Syria by deploying anti-aircraft missiles. On America, he said Russia wanted to develop relations “irrespective” of who would become its next president. Vladimir Putin said his country’s economic crisis had peaked. While oil prices had fallen sharply, he said, manufacturing had shown slight growth and there was a healthy trade balance in agriculture. “Our economy depends on oil and gas prices, we expected Brent to be worth $100 dollars per barrel, but then it was 50, but this was an optimistic prediction too, our forecasts have to be amended again,” he said. Vladimir Putin is known for his marathon performances at his news conferences, where he frequently uses hard-hitting, colorful language. In an interview with state TV on December 16, Kremlin spokesman Dmitry Peskov said Russia was a target in a “big information war [which] has been waged for a long time”. In 2014, Vladimir Putin’s annual news conference lasted 3 hours and 10 minutes, while the record was set in 2008 at 4 hours 40 minutes.